“In Year 5, everyone in my class got the chance to learn a musical instrument for the year as part of ‘Wider Opportunities’, I chose to learn the flute and I have carried on learning so I can play in an orchestra when I am older.” – Harvey, Year 6. We are proud to have been one of the pilot schools for the ‘Wider Opportunities’ scheme. 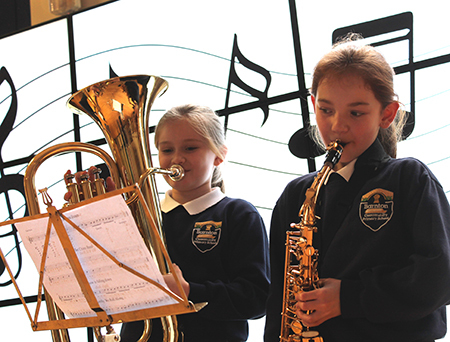 Over the past decade, every child in our Year 5 classes has had the chance to choose which instrument they would like to learn, then has expert tuition for an afternoon per week; building up to a concert at the end of the year. Children have also had the opportunity to play alongside the Halle Orchestra in the Bridgewater Hall in Manchester. A truly magnificent experience that will stay with them forever. Many of our students have continued their music tuition into Year 6 and beyond, representing Barnton as members of the Vale Royal Youth Orchestra.